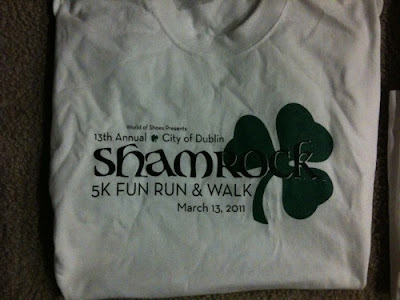 I hadn't done this race in a few years so I figured it was time to do it again, the 13th Annual Shamrock 5k in Dublin. The early registration fee was $21 per person and included a t-shirt, timing chip and post race food and entertainment. 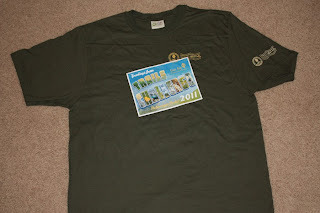 The bib and timing chip were mailed prior to the race and there was an opportunity to pick up your t-shirt a few days before the race as well. This made the morning of race day much smoother and let me sleep in a little longer which was appreciated since we lost an hour because of daylight savings. 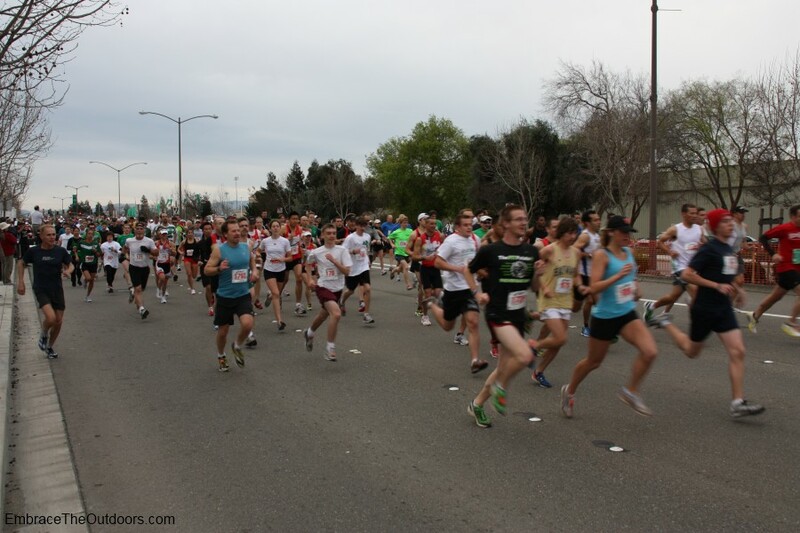 Race day registration was also available at $25 for Dublin residents and $30 for non-residents. There were supposed to be designated parking areas near the race start but there were just a lot of parking lots for businesses. I picked one of the lots and then made my way toward the start of the race on Dublin Blvd. One side of the street was closed at the start line so there was plenty of room to mingle without the worry of cars. There were pace signs along one side of the street but the crowd bunched up at the front by start time. The race started right on time at 8:30am. The route headed west on Dublin Blvd then north on Village Parkway before turning onto Amador Valley Blvd. 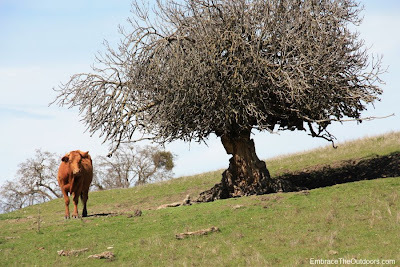 After a short detour on York Drive I was running on Amador Valley Blvd again. The course had been flat until this point but then there were a few short hills. 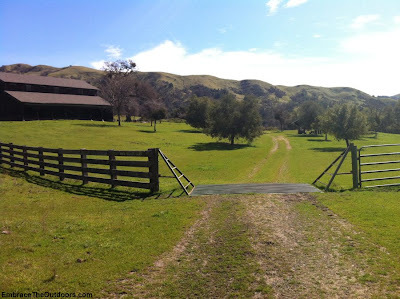 After turning onto Iron Horse Trail and then Alameda Creek Trail, there were several more rolling hills. The course narrowed a bit here but it was still plenty wide. As this trail follows the creek there were lots of little flying bugs that seemed to have a mission to crash into my face or end up in my mouth. I ended up swallowing a couple. The finish line was drawing near but I could not make it out. Then I saw a big crowd huddled around what looked like a water station and soon realized it was actually the finish line. The finish area itself was narrow and very crowded. It was not easy for spectators to see their loved ones or for runners who had finished to go back along the course to cheer on those still running. 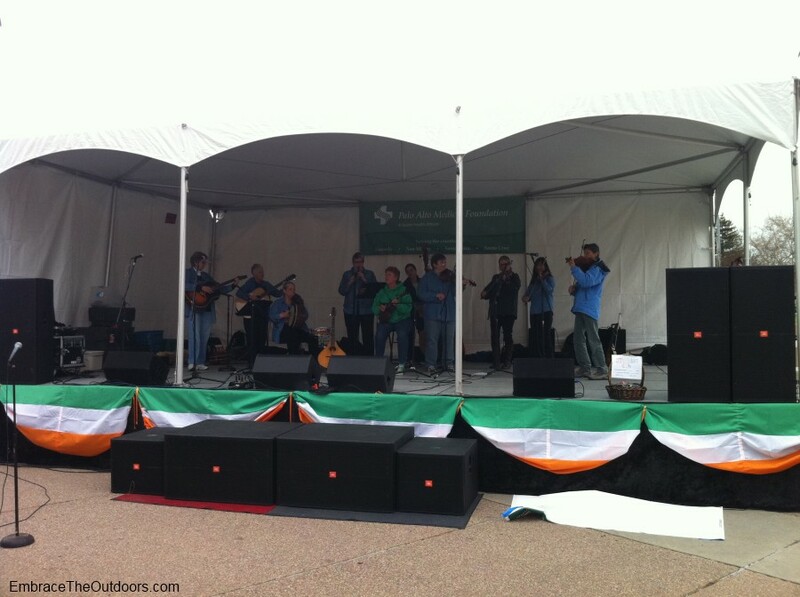 To get back to Dublin Blvd from the finish I had to make my way through the Civic Plaza and the festival booths. Postrace food was available there and included muffins, pizza and cups of water. Race day weather was overcast and cool but not cold-great race weather. The course itself was well marked with plenty of volunteers to steer runners in the right direction and times were called out at miles one and two. There were a few water stations along the course as well. Overall the race was good but a bit crowded, I think a 10k race option should be added to help thin out the crowd. The parking and race finish could use some work as well. Until then, I probably won't run it again. 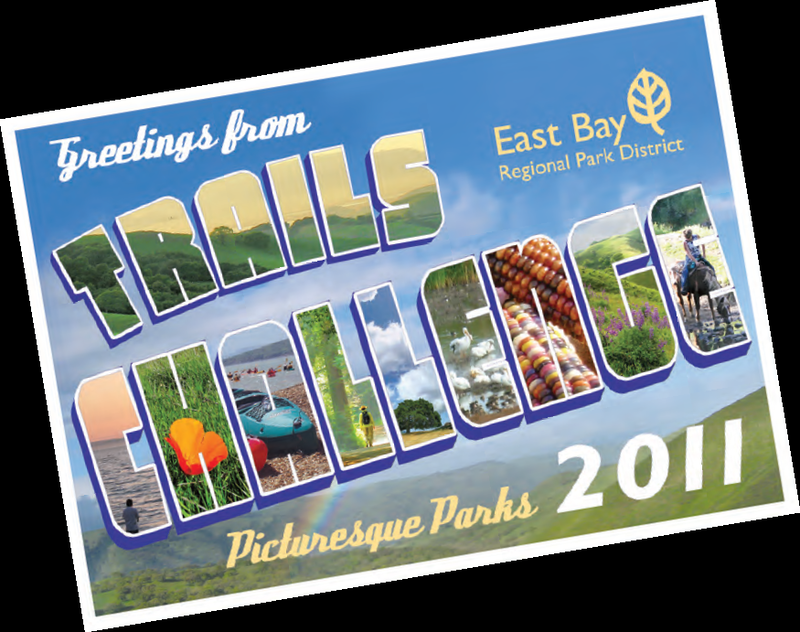 If you haven't already you can still sign up for the East Bay Regional Park Districts' 2011 Trails Challenge. 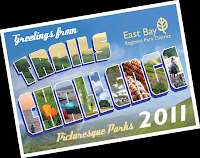 This is a self paced program aimed to get people out to enjoy the many parks in the East Bay Regional Park District. Registration is free for Alameda County and Contra Costa County residents and for Kaiser Permanente employess who are also Northern California residents. Registration gets you a downloadable guide booklet and trail log, an organic T-Shirt and a commemorative pin for those who complete the challenge. To complete the challenge you need to travel 5 of the 20 trails in the guide booklet or travel 26.2 miles of trails featured in the guidebook by December 1, 2011. T-shirts can be picked up at one of five Visitor Centers: Black Diamond Mines Regional Preserve, Coyote Hills Regional Park, Crab Cove Visitor Center, Sunol-Ohlone Regional Wilderness and Tilden Nature Area. 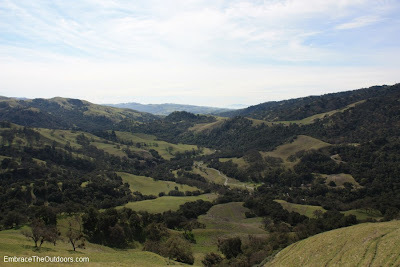 We took advantage of the break in wet weather and went to Sunol Regional Wilderness for a hike. This time we took some beginning hikers with us. We have done a few hikes here in the past but we had not done the Flag Hill Trail. We parked by the Visitor Center and headed across the parking lot to the foobridge. After crossing the footbridge we headed left towards Flag Hill Trail. The dirt trail was narrow right from the beginning. After just over a quarter of a mile we hit a fork on the road, with the right leading to Shady Glen Trail, we continued towards the left. Right after this junction the trail began to climb. We didn't have to climb long before being rewarded with views of the park. We hit a few switchbacks as we continued to climb, and climb, and climb. There were a handful of shaded areas on the trail but the majority of trail was exposed. We saw some beautiful California poppies growing along the side of the trail. 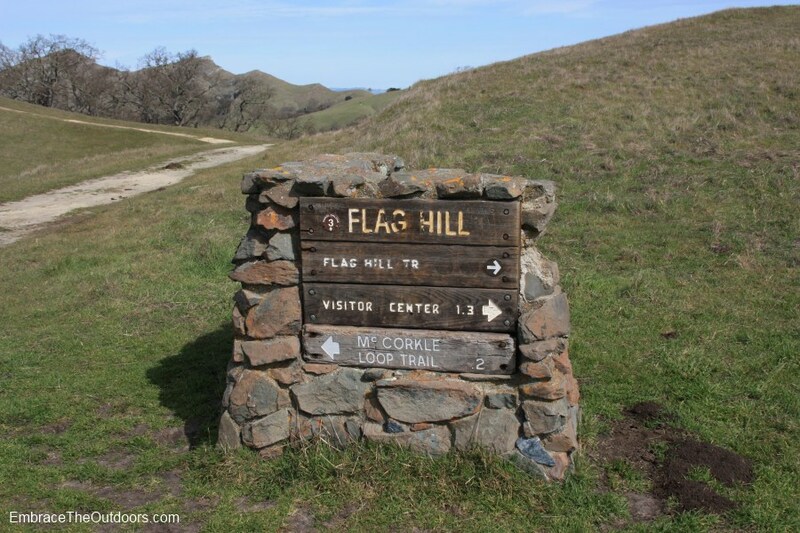 We climbed nearly 1000 feet on the narrow trail for 1.26 miles before reaching Flag Hill. The trail was steep but even the beginning hikers who were with us managed well. The views of the park, Alameda Creek Watershed and Calaveras Reservoir were well worth all of the gain in elevation. We were lucky that it was such a clear day and with it being early in the year the hills were still beautiful shades of green. After some snapshots we took the short and popular detour for even more amazing views. There was a small group of people here as well. This area was rocky and along with a bench closeby it proved to be a good place to take a break. We refueled and headed back towards Flag Hill Trail. At this point we could choose to retrace our steps back down the trail to our car or take another trail back making the hike a loop. 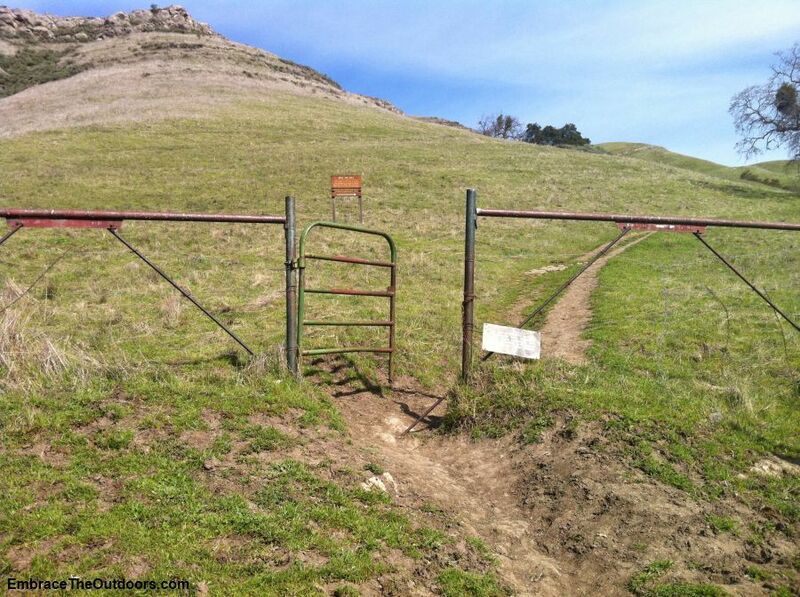 We opted to make the hike a loop. Instead of heading back down Flag Hill Trail we took the trail a little further before turning right onto High Valley Road and then another right onto Hayfield Road. Both of these trails were much wider than the trail we took on the way up. 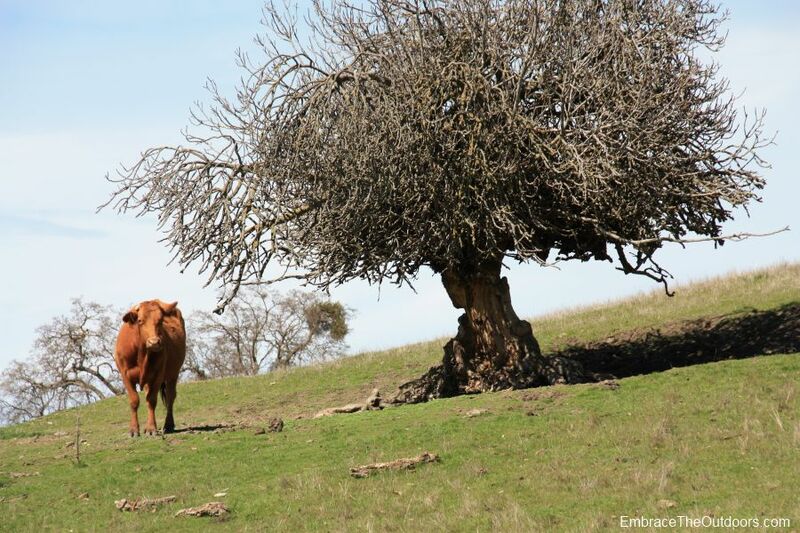 We got more good views and came fairly close to cattle at several points. 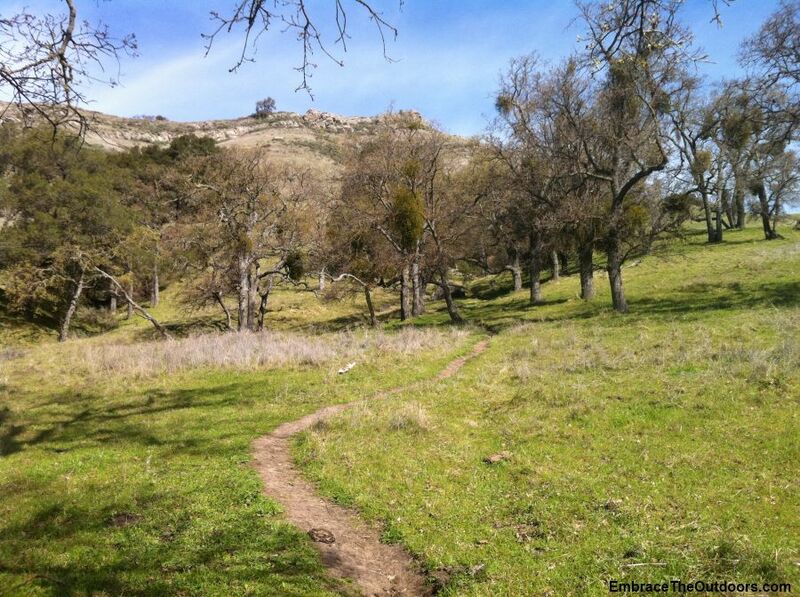 Although a little longer, this route back was not as steep as Flag Hill Trail. We did come across a few people heading in the opposite direction. We also passed by the High Valley Camp which included several picnic tables. After about 2 miles on our mostly downhill trek, we made it back to the footbridge. We crossed it once more before heading to the Visitor Center to pick up our shirts for the 2011 EBPRD Trails Challenge and then onto our car. In total our hike was about 3.75 miles and took us about 2 hours and 20 minutes. 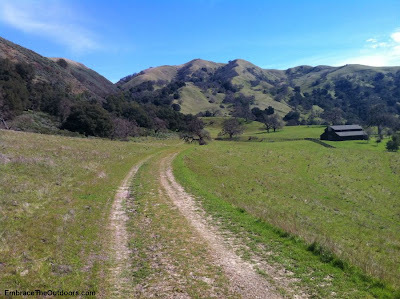 The views were amazing thanks to the clear skies, it is a great spring hike. As everyone hopefully knows, you need a permit to hike the Half Dome cables regardless of the day. On March 1st permits went on sale for May and June. As I understand it all dates for those months sold out in less then 15 minutes. So if you tried hopefully you got yours. If you're going to try for dates later in the summer you need to try right at 7am on the day they go on sale. 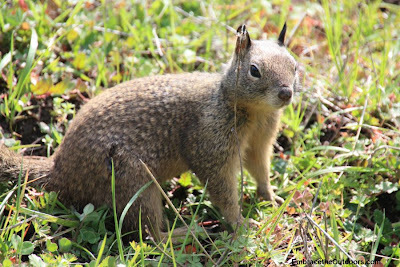 Now if you're going to be hiking Half Dome please be prepared for it. It is almost a 16 mile round trip trek from the valley. If you have never done it before, make sure you know what you're in for. If you want all the details on the hike then I recommend you turn to Rick Deutsch - Mr. Half Dome. He has done the hike at least 28 times and is the author of the book One Best Hike: Yosemite's Half Dome . The book is 100+ pages completely dedicated to conquering the epic hike. It gives you detailed info on every part of the hike and is full of great tips. Another way to learn is to go to one of Rick's presentations where you can meet him in person and listen to his advice on hiking Half Dome. I went to one of his presentations back in 2007 and found it very informative and entertaining. He has several presentations coming up in the area, so check one out.